6th Annual Harvest Dinner :: SOLD OUT! 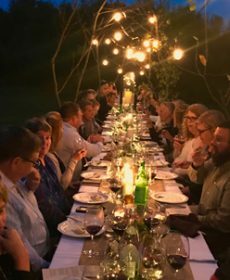 Enjoy the bounty of the season in the unique setting of ThornCreek Winery & Gardens at our 6th Annual Harvest Dinner on Sunday, October 7 from 5-8pm. It’s farm-to-table at its finest. Guests will enjoy a 5-course meal made with locally grown product, paired with our Award-winning Wines, and music with Mo Andrews. $80 per person with reservations required. Please call 330.562.9245 or email winemaker@thorncreekwinery.com. ThornCreek will be open from 10am-2pm, serving a limited menu.